Prolab's N Large 3 is probably one of the more popular weight gain supplements out there right now, and it's rightfully so for a reason - it works. When combined with good use of creatine, you're almost guaranteed some decent weight gain. Read about creatine here. If you've been looking for a protein supplement that works, try Prolab's N-Large 2. Read on to find out why. Prolab has done a real nice job with N-Large 2, making it easily mixed even without using a blender. I have to admit, I still get some clumps once awhile, but compared to other protein supplements I've tried, N-Large 2 mixes quite easily. For those who have a tougher time cutting down on body fat, you might want to watch your calories carefully with N-Large 2. 2 servings of these a day will put you at over 1200 calories, and that's not including calories from milk! But for hard gainers like myself, this is almost a godsend. :) For what's contained in N-large 2, it's great for anyone who's trying to pack on weight. Note: each serving of N-Large is 4 scoops, which is 152 grams, and that's a lot! You might just want to take 1/2 servings at a time. 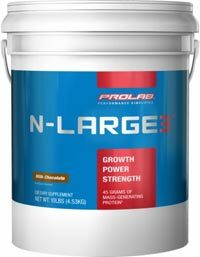 Now, Prolab's N-Large 2 contains a lot of other good stuff other than just proteins. ;-) let's see what they are. L-Alanine: a non-essential amino acid that's highly concentrated in muscle. Can be broken down into glucose and used for energy. Also stimulates the immune system - it's good for you. L-Arginine: a non-essential amino acid used by the immune system to regulate thymus gland. 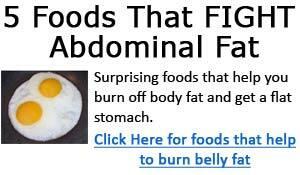 It's required in muscle metabolism, and facilitates increase in muscle mass and reducing body fat. L-Tyrosine: an amino acid that's a precursor to many neurotransmitters related to how you feel. A deficiency results in depression and reduced ability to cope with stress. It help improve endurance, and improves performance under stressful situations. L-Tryptophan: an essential amino acid that's one of the building blocks of protein. It's an essential precursor to a number of neurotransmitters in the brain. These are just some of the 'goodies' in Prolab's N-Large 2 protein supplements. For under $60(USD) for a 10lb bucket, it's definitely worth the investment. If you order N-Large 3 online, you can save yourself a good few dollars. I recommend you purchase N-Large 2 online and save some money.